Left to right (in order of purchase). Knot is super dense, bit releases easily. In between The Varlet 'Finest' and Paladin 'Select' more toward Paladin. Shout out to @"landlgrooming" for crafting these brushes. I know sometimes the community at large can be a handful and act entitled. Thanks, Scott, for being amazing and bringing such awesome products to market! I noticed the titanium handles when they were first put up. I was in the habit of checking the website a few times a day hoping to get a brush. The C&R brushes were not part of the budget for me that day. I am glad to see one of them found a good home. Great looking collection. Nice variety of materials and knot sizes you've got. That Franklin looks great in blue too! (05-12-2017, 12:30 AM)landlgrooming Wrote: Thanks, Spencer! Scott, I think this is an example of the old adage that 'The cobbler's children are always the worst-shod'. 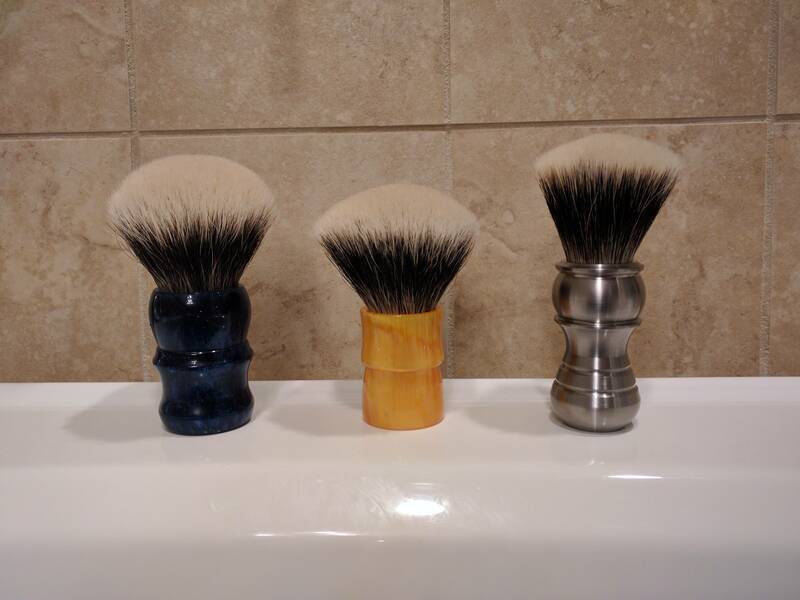 Perhaps you're spoiled by using your soaps, which I think could be nicely lathered with just about any brush. Nice brushes! I especially like the titanium one. (05-11-2017, 09:54 PM)bakerbarber Wrote: Very nice! I really love the handle and ergonomics of it. The picture does not show well, bit there is sparkle flakes in the handle and its very handsome in good lighting. The knot is super dense and reminds me of most of my 2-Band Super knot from my old Simpsons. Great density while still having easy lather release. (05-12-2017, 03:16 AM)Hobbyist Wrote: Nice brushes! I especially like the titanium one. It's surprisingly hefty in the hand. I'm glad it's the smallest of my knots, any bigger and it may become unwieldy. 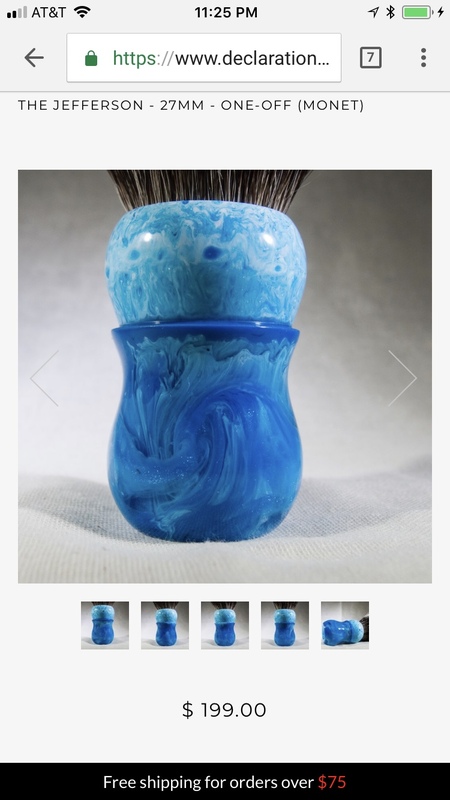 Incredible looking brushes! Especially the ti! Bet these are hard to find now. 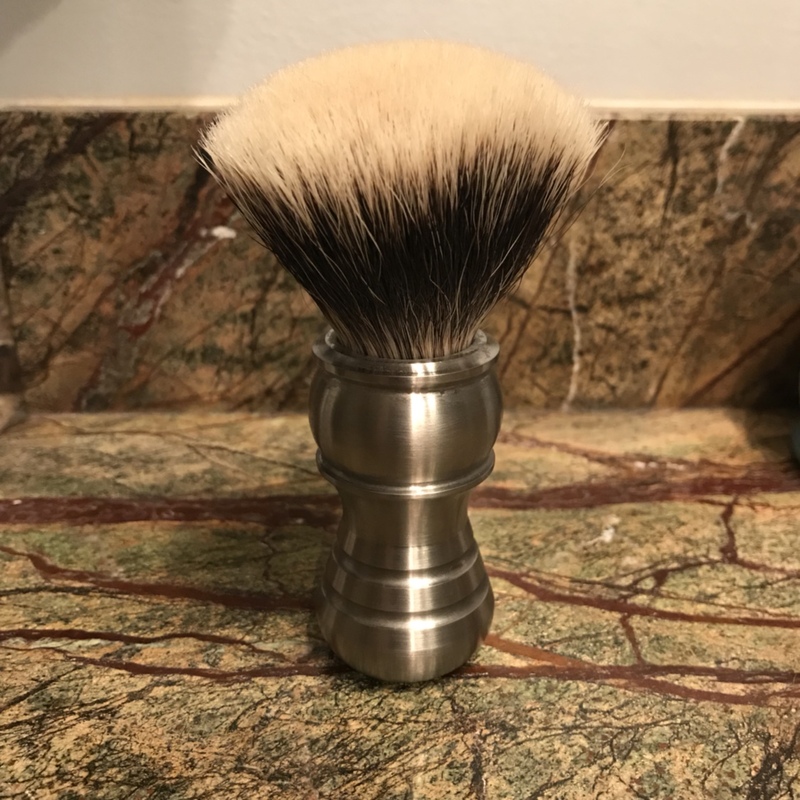 Found myself a b2 C&R ti and it’s amazing. Now I need to find one of the blue ones in a B2 knot. Maybe I’m asking too much? This is the last place I can think of to look for who might have purchased the new Declaration monet Brush. If someone has it I would like to at least let them know should they ever decide to part with it for sale or trade I am interested. I got the Van Gogh after I was a hair too slow in checking out with PayPal for the monet. Thanks!